Located in the highly appreciated Blue Bay Golf & Beach Resort Curacao we may offer you a top of the list villa in T-section with superb views over the 18 holes golf course as well as the Caribbean Sea. 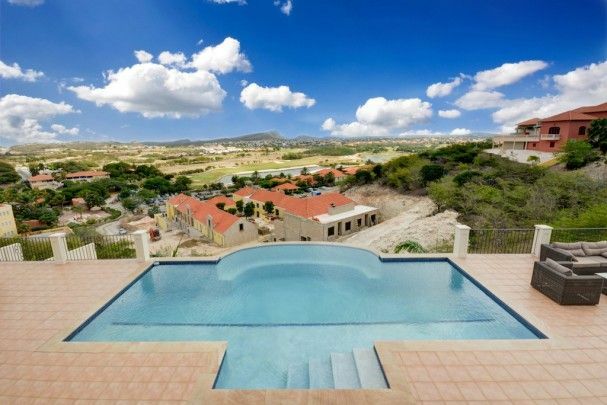 This beautiful villa features three bedrooms, five luxurious bathrooms, two guest rooms and a private swimming pool. 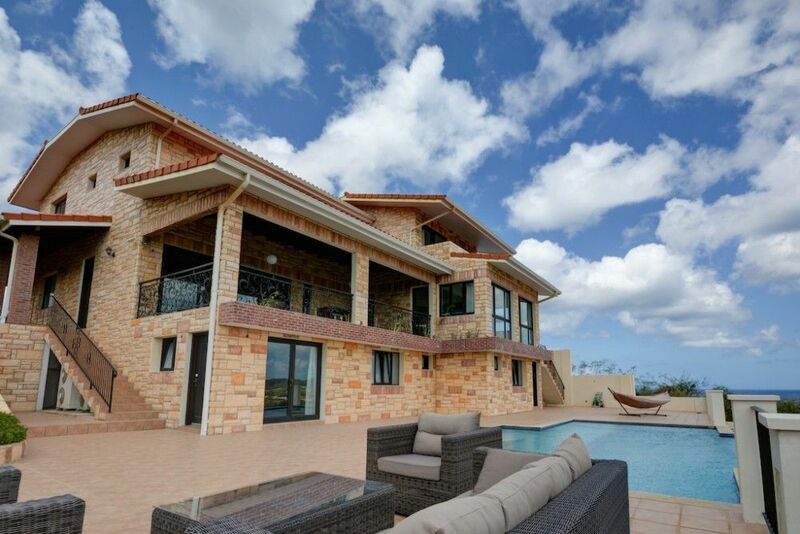 This high quality unique villa is located on an equally unique plot of land providing you with the most stunning views you can image on the beautifully landscaped golf course and crystal clear blue waters of the Caribbean Sea. The villa is built on a wide lot of 1.556 m2 with a total living area of approximately 700 m2. 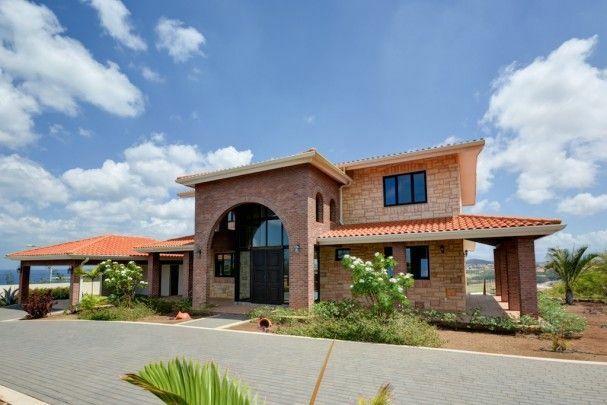 This one-off villa offers you luxury, exclusivity and an exquisite design. 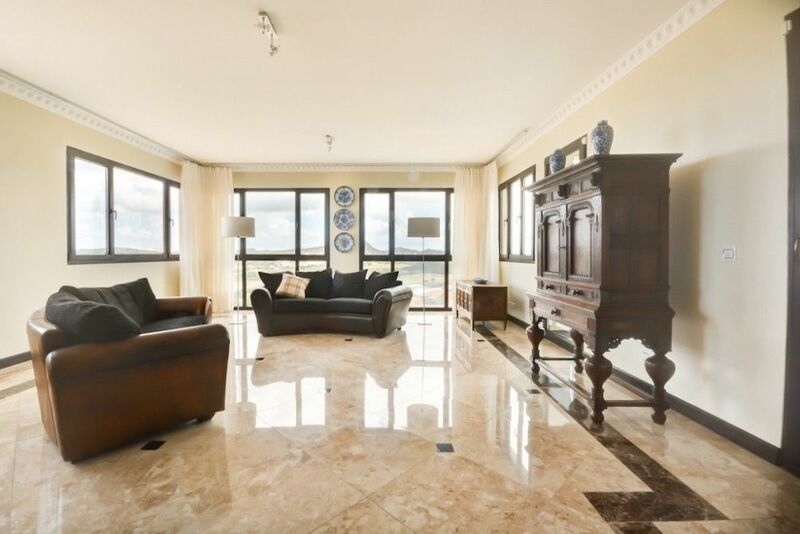 Every detail in the design in well thought through and no costs have been spared which shows in the fully equipped luxurious kitchen with granite counter top, the luxurious bathrooms and the natural stone floors. Via one of the two electronic gates and an impressive drive you will reach the main entrance. The royal doors, placed in the glass facade lead to entrance area with raised ceiling and grand spiral staircase. 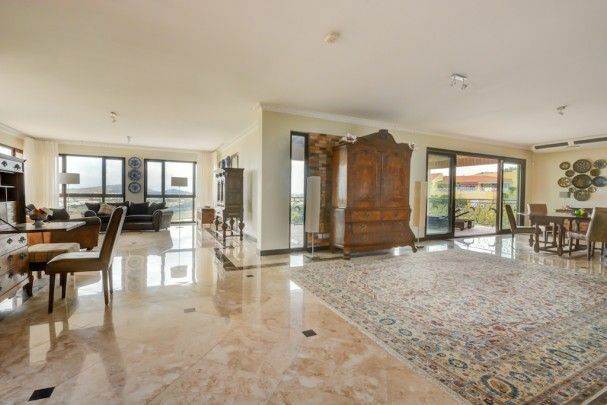 Left of the passage you will find the wide living and kitchen and on the right the dining room with entrance to the spacious balcony. On this floor you also find the study/TV room. 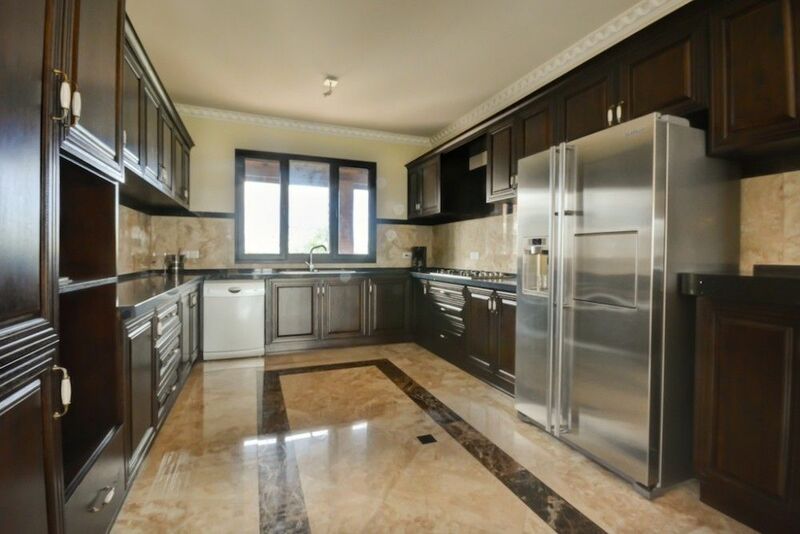 To create this practical large half open kitchen with breakfast bar only the best materials have been used such as wooden cupboards and drawers, a granite counter top, A-brand built in equipment and a double door American style refrigerator. Relax on the large balcony and enjoy the breathtaking view of the Caribbean Sea and the golf course. Cool down after a day in the sun in the fully air conditioned living room and kitchen. 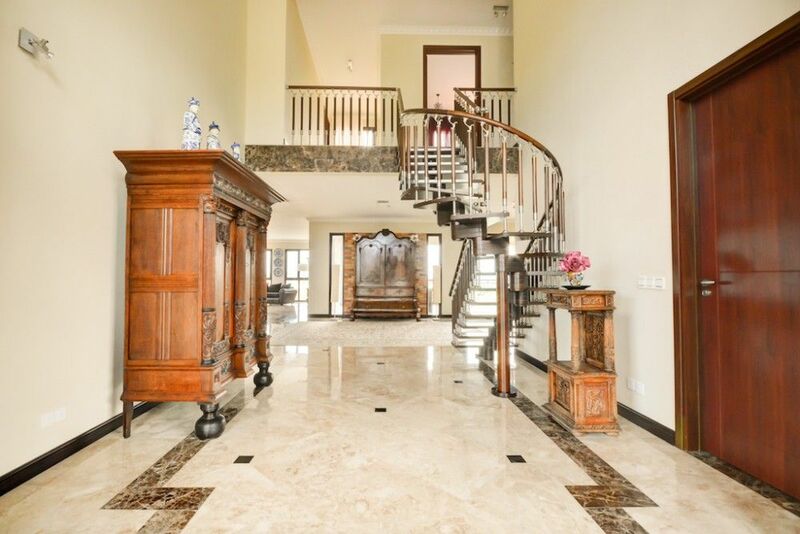 The impressive spiral staircase will take you to the top floor with three very large bedrooms with private bathroom. Pictures of the master bedroom would not be out of place in one of the exclusive home magazines. 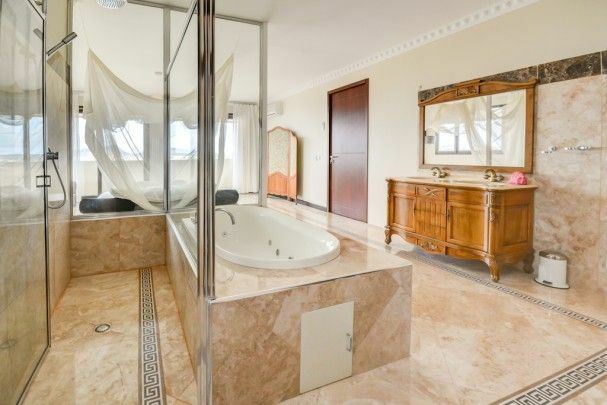 You will experience the ultimate feeling of being pampered in a luxury resort with this spacious bedroom equipped with walk in closet, open floor bathroom with Jacuzzi and walk in shower with beautiful natural stone and mosaic. Savor the cool breeze while relaxing in privacy on the balcony and let the gorgeous views astonish you. In the rear of the house you will find a large infinity pool surrounded by a spacious terrace with stunning sea views from every angle. Entertaining guest is no problem in this splendid villa. 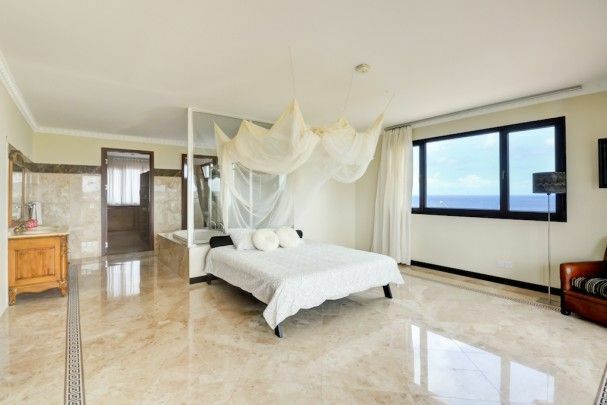 The villa features two roomy apartments, each with their own private bathroom with the same beautiful natural stone floors. 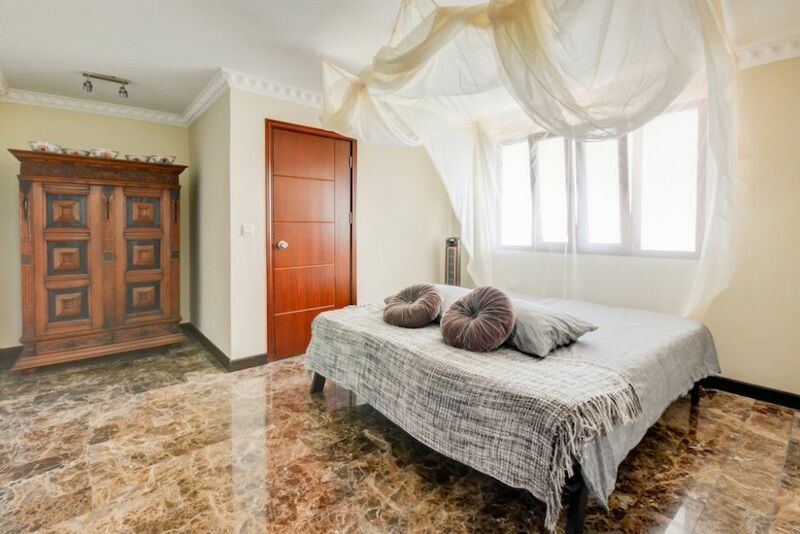 You will find one apartment with a bedroom and bathroom and the other apartment with a living room, a bedroom and private bathroom. The apartments are located directly adjacent to the pool and of course offer beautiful views. Next to the house is the carport suited for two cars and a BBQ spot. The beautiful tropical garden features a drip system to keep it in perfect condition. This lush green oasis is fully fenced and equipped with an alarm system and security cameras. 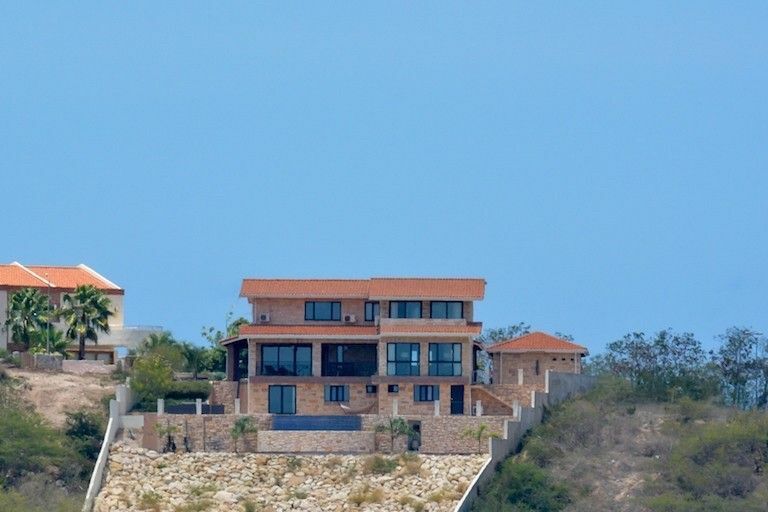 You will not be able to find another villa like this one. Please take the time to watch our short video impression of the views. Please contact Mark Albers if you would like to schedule a viewing.